We offer high quality kitchen and bathroom cabinets at an affordable price and a speedy timeline. Most of the product available at The Cabinet Shop is 100% real wood construction. Our kitchen cabinets are constructed from furniture grade hard maple and come standard with features like 1/2" plywood sides and SOFT-Closing under-mount drawer glide system. Many accessories are available like glass-fronted display cabinets, Lazy Susans, pull-out spice racks, trash bin pull-outs and moldings including crown moldings and oven hoods as well as wine racks. 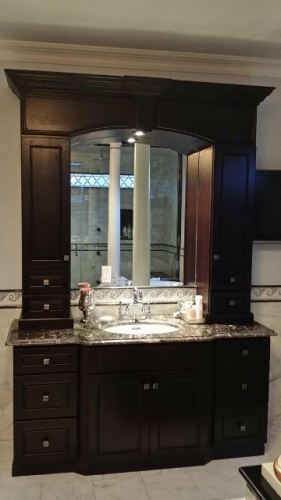 You can also find vanities and other bathroom furnishings from trusted brands like Farimont Designs. We offer beautifully designed, well-constructed products with design themes ranging from traditional to transitional, contemporary to rustic; sophisticated to casual. We also offer furniture style islands with features like working drawers, open storage, fixed shelves with removable wine racks, and fully adjustable spice shelves. We offer Butcher block counter tops or natural stone. Decorative door hardware- knobs, pulls, back plates etc. bath hardware as well. All that and more.